Ladies and Gentlemen: secure your wigs, hold onto your edges and get your popcorn buttered; yesterday marked the official return of the hit reality TV series, Love and Hip Hop: Atlanta. Our beloved and entertaining cast returns to stir the pot, or in the words of Miss K. Michelle "shake the table." We'll be ruminating on everything that happens each episode with our weekly recaps detailing the biggest storylines and most captivating plots. Keep it locked every Tuesday morning for a new recap. Stevie J returns as a series regular with a fresh new outlook on life. Following a hectic season seven with co-stars and former Danger-Zone artists Erica Mena and Estelita, the producer is now determined to turn over a new leaf and implement a drama-free lifestyle. Unfortunately, Stevie's track record shows his inability to steer clear of the commotion. As such, he reveals the true motives behind his return to Atlanta—Stevie got hitched (for real, this time)! 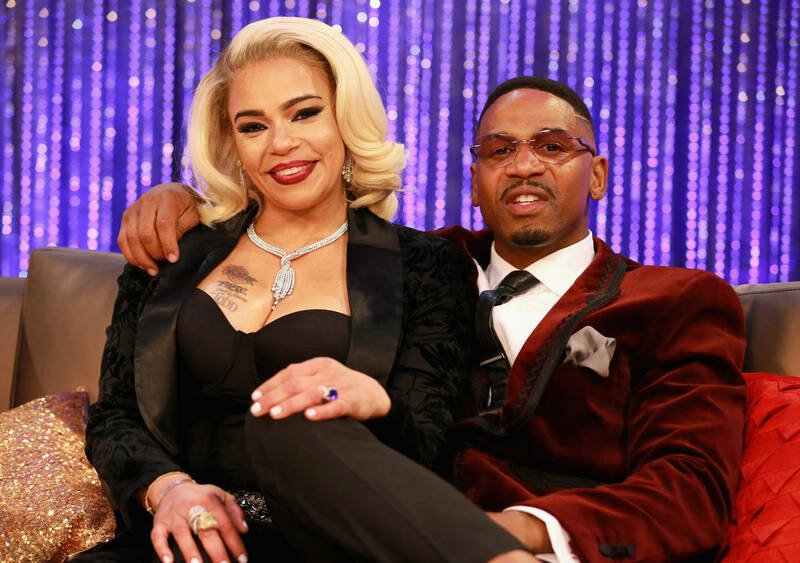 The father of six announced his recent marriage to his “best friend,” R&B soulstress and former wife to the late Notorious B.I.G: Faith Evans. The lovebirds broke down the news of their marriage to Stevie’s daughter Eva over rice, shrimp, and broccoli. Though the latter may have prompted a positive response from the child, Stevie J’s old flame and baby mama’s Mimi did not share the same feels. A preview of the season already reveals the very drama the newly-wedded producer was attempting to avoid. SPICE UP OR SWITCH UP? Spice’s introduction to the world of Love & Hip Hop Atlanta was unique. The Jamaican-born rapper experienced several transitioning difficulties mainly due to cultural differences. In season seven, animosity peaked between her and cast member Tokyo Vanity over fat-shaming comments. The two patched things up at the reunion however and showed a sustained bond through this season premiere. Though Spice began her cameo with a fire performance, things quickly came crashing down following offshore comments from an artist development producer Jevon Dewand. Their interaction left Spice feeling insecure about her looks, which according to Dewand, were in dire need of change in order to appeal to the American market. Though Spice felt it was more than that and redirected Dewand's comments to her insecurities surrounding her darker skin tone. The rapper thus chose to address colorism in the music industry and specifically, the black community in her own, unconventional way. Spice went ahead and white-faced herself as an outcry (or maybe outroar?) and not everybody took the news lightly, specifically Rasheed and Mimi who reacted explosively to Spice’s new idea. Hide your kids! Hide your wives! The first episode already places our series-regular Mimi on a warpath. A sketchy 9-1-1 phone call reveals the poor mother was shot at in her garage following a failed home invasion. Fortunately, the shot missed, and Mimi as well as her daughter, Eva were safe. Though where the gun blazes, smoke remains. Upon learning of Stevie’s recent marriage and Eva meeting his new wife through the mouth of her own daughter, Mimi’s ball of fury was certain to unravel. And indeed, it did, following an altercation with Jamaican diva Spice over her new awareness campaign surrounding the devastating psychological effects of colorism in the black community. Though drama follows where Mimi goes, we can say she’s here for all the smoke. Mama Dee’s arrival into scene showed our favorite grandma twerking for the 'Gram on her birthday. Though the Prince, Scrappy, did not come out of the kingdom this time around, Mama Dee revealed his wife Bambi was ready to deliver. Unfortunately, friction was reported on the western front with Bambi’s mother, Cece, who’s been staying with them until the delivery. And as such, we can expect things to go down-- Love & Hip Hop Hollywood’s A1 and Lyrica have shown us exactly what happens when the mama’s don’t like each other. Karlie Redd is also back with exciting news. It seems the Trinidadian hip-hop artist who once “popped them tags” now got somebody to pop the question. And no, it is not Young Joc or Sean Garrett, but a mystery man by the name of Maurice “Mo” Fayne. Though, is that enough to assume Karlie will be way too busy planning her own wedding to play investigator and/or meddle in the business of others? Only time will tell. Things are looking up for Scrapp Deleon who was finally released from jail and transitioned into a half-way house. The rapper rose to fame in season five due to his arrest as well as his tumultuous relationship with co-star Tommie Lee. Despite Deleon leaving jail, it is revealed his former flame Tommie is facing serious criminal charges which may keep her behind bars for a long time. Deleon’s return was slowed due to the courts requiring a relative with no criminal record to bail him out, something the TV personality thought he couldn’t offer. That was until his mother Karen King revealed the existence of a half-sister with no previous criminal record. Though grateful for his surprise relative Cheyenne, Scrapp remained suspicious of their link. When placed in the hot seat, KK revealed the shocking news that Scrapp’s father is not only alive and kickin', but Cheyenne is also the product of his affair. Talk about messy! Welcome home, Scrapp! Drama continues with the Jordans as a frustrated Mimi demands answers from her former beau Stevie J. The lovebirds and Mimi have a sit-down in a cozy restaurant to have the difficult conversations. Though I’m certain we all expected some wig-snatching, table shaking and water throwing, the union was actually quite amicable. With Faith Evans around, Stevie might actually be a changed man. The three had a mature conversation on Mimi’s expectations with regard to Stevie and Faith's marriage, as well as the vigilance with which Stevie must handle grown folk talk with his daughter Eva. Spice remains on course with her colorism awareness campaign and moves onto carrying the message to the music via an upcoming single. Despite animosity building between former friends Mimi and Rasheeda, she remains headstrong about sharing her message. Several members of the cast discuss Spice’s drastic measures leading us all to wonder whether the chatter will indeed render her efforts to get her point across successfulyl. The King house experienced quite the shock upon learning Scrapp’s father is indeed alive. However, things got really real when Scrapp’s father actually showed up to the house to meet his son for the first time. Their meeting ignited internal turmoil within Scrapp, who began questioning his mother’s motives behind hiding the truth about his father still being alive for 3 years. Though his mom shows no remorse, it seems the entire affair is beginning to take a toll on the once-strong mother and son bond they had. Karlie Redd is enjoying being boo’d up and planning wedding details with boyfriend Arkansas Mo’. As the two share pancakes and giggles, on the other side of town, a sleepover is bringing forth a reckoning. Pooh, a recent addition to the series, is introduced as being wife to a major music industry mogul. As Pooh proudly reveals the open status of her marriage, she shares the painful news that she was not invited to Karlie’s wedding. The girl chatter turns into an eventual showdown between Karlie and Pooh, resulting in insults, injuries as well as potential claims that Karlie already tasted Pooh’s honey. Whether or not such comments are factual or not may only be for us fans to find out on the next episodes of Love & Hip Hop Atlanta. Kirk’s affair with pop-up Queen Jasmine Bleu was one of the most scandalous reveals of the entire series. With a surprising addition to the family and their relationship dynamics somewhat restored to equilibrium, Rasheeda and her man are working on making their new family work. Kannon, Kirk’s love child, visits the “She-ma” home for the first time and things do not go as planned. Subtle commentary from both Rasheeda and Kirk made on the show sparked an explosive reaction post-season premiere from Jasmine—who was not here for the games or questioning surrounding her ability to care for her son. We can only hope the combined family works together in unison for the well-being and happiness of all involved parties.